Howard sat for Charles Willson Peale sometime during the early 1780s. The portrait was completed by 1784 when it was listed in the advertisement for the museum printed in the October 13 Freeman's Journal and Philadelphia Daily Advertiser. Although Howard wears a medal, it is not the one awarded him by Congress in early 1781 to commemorate his heroism at the battle of Cowpens. Completion of that medal was delayed until late 1789 when its creator, Benjamin Duvivier, displayed it at the French Royal Academy's annual salon. The medal in the Peale portrait bears a different Latin motto (inscribed ;VIRTUTE ET JUSTITIA VALET”) from that made by Duvivier. It may represent recognition of Howard's Cowpens valor by one of the southern state legislatures. Peale painted a replica of the Howard portrait (now at the Hampton National Historical Site) for the subject's family around 1787.
oward was born June 4, 1752 in Baltimore, Maryland. At the beginning of the Revolution, he joined the Continental Army as an officer. 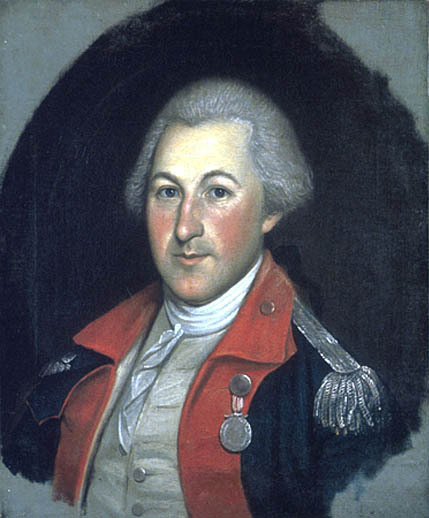 He fought at White Plains and in the Monmouth campaign. In 1779, he transferred to the war's southern theater and the disastrous American defeat at Camden, South Carolina. Later, he led his troops at the battle of Cowpens (for which Congress awarded him a silver medal), Guilford Courthouse, Hobkirk's Hill, Eutaw Springs, and Charleston. After retiring from the army, he served in the last session of the Continental Congress. Following that, he was Maryland's governor for a term and then a state senator. He spent one term in the United States Senate, but declined an appointment as Secretary of War. During the War of 1812, he commanded the defense of Baltimore. An outspoken Federalist, he was their unsuccessful candidate for vice president in 1816. Howard died in Baltimore on October 12, 1827.